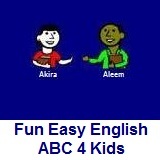 ﻿ Fun Easy English - new writing english alphabet for kids letter h.
Hey kids, try writing the letter H.
I used a hammer to build shelves for my books. The hen is sitting in the nest. The house is very small.